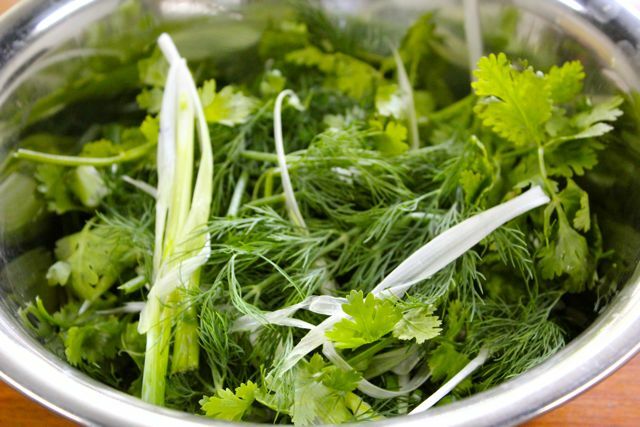 Finding fresh dill in Manila (or Central Luzon for that matter) during the rainy season is like searching for the proverbial needle in a haystack… So I was resigned to wait until the holiday season to take a stab at cooking Cha Ca La Vong at home. But a few days later, while picking up some staples at the SM grocery in Cebu, several packages of fresh dill were just sitting in the chillers, and I bought everything they had, say 100 grams worth or so. 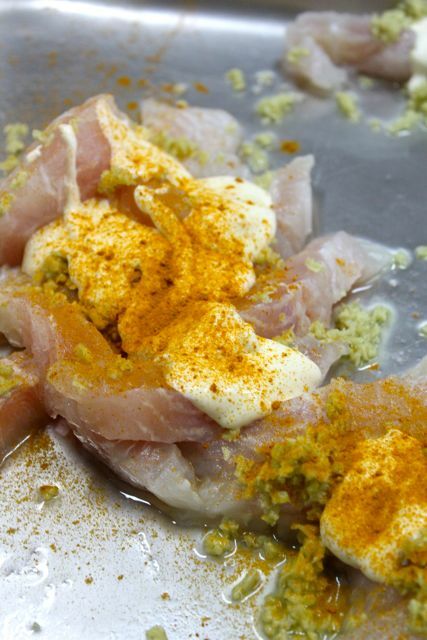 I brought the dill to the office in Cebu, rummaged around a freezer for some frozen fish fillets and checked to see if we had powdered turmeric… Soon after, we were experimenting with Cha Ca La Vong in our commissary kitchen. This version was really quite easy to make, and it tasted terrific! First, finely mince some galanggal or ginger if you don’t have the former ingredient. 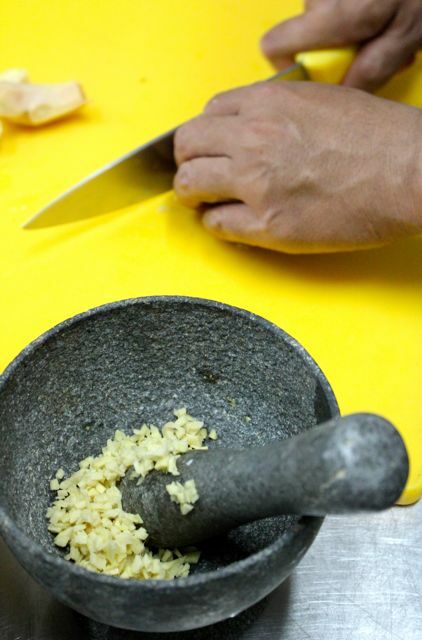 Smash it up in a mortar and pestle. Slice up some firm white fleshed fish (we used two cream dory fillets, that was the only choice other than bangus in the freezers) but good tilapia fillets or other freshwater fish might do nicely. 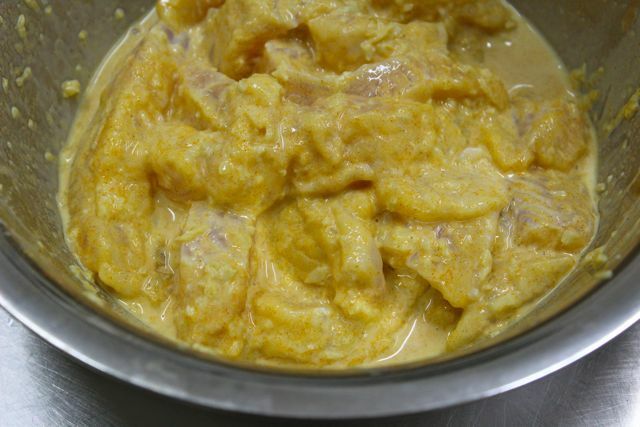 Place the fish in a bowl, add the smashed ginger, a half cup of plain unsweetened yoghurt or sour cream, half a tablespoon or so of powdered turmeric and some salt and pepper to taste. I added in some fish sauce (thai) only because we didn’t have the guinamos-y, greyish fish or shrimp paste that is probably closer to the original ingredient used in Vietnam. Let this all marinate for a couple of hours, covered and in the fridge. 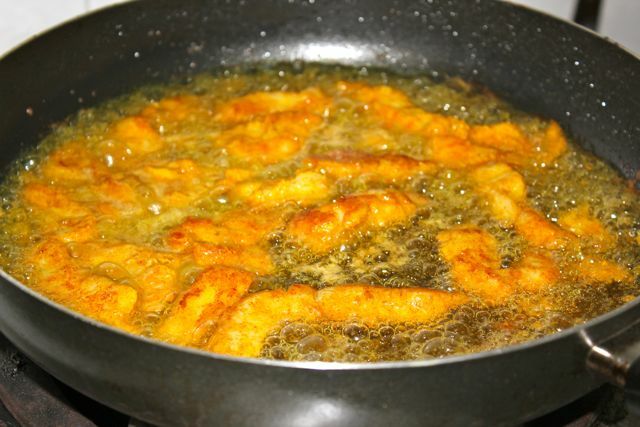 When you are ready to cook and eat, set a medium to large sized saute pan on medium heat, add more lard or vegetable oil than you think is necessary, say 3/4 of a cup or so, then dredge the fish in some fine rice flour (or all-purpose flour) and saute for a few minutes until just cooked and it takes on a nice sunny rich color. For me, the lard added another dimension of flavor that vegetable oil will not provide. Add in your shredded spring or green onions, lots of dill and I added a bit of coriander as well. The added herbs wilt quickly, retaining their vibrant green color. Take the pan off the heat and serve immediately with some rice noodles on the side (previously cooked, served at room temperature), and a bowl of fish sauce/lime juice/sugar/ water and a bit of chilies. Throw in some chopped up peanuts as well. Interesting dish and healthy to boot. Now if i can only find fresh herbs in this weather… Where did you get your rice noodles Sir Marketman? looks yummy! imagining all that oil mixed in with the sauce makes me shudder though. millet, just use half a teaspoon or so to “lubricate” your noodles… :) Zerho, I used boxed Thai rice noodle sticks, soaked for ten minutes, blanched for about two minutes, then put under cold water to stop the cooking. Hi! So the oil is not drained after cooking? and what is the sauce made of (in the pic it looks saucy). Is that the oil? got it! this looks really flavorful! we’ve been trying to see what else we can do with dory. for now we just add panko bread crumbs for a crispy fry, and that is it. plain.crispy. dory. will surely do this soon! thanks! We’re lucky here in Oz as we can get fresh herbs anytime and anywhere no matter what season it is. Have to try out this dish and thanks for sharing, MM. thanks, MM..half a teaspoon or even a teaspoon doesn’t sound too bad. “to lubricate the noodles” is a good reason ;-) can’t wait to find use for all the turmeric in my backyard. Didn’t find dill or thyme when I went to the grocery yesterday. Just lots of basil and mint. 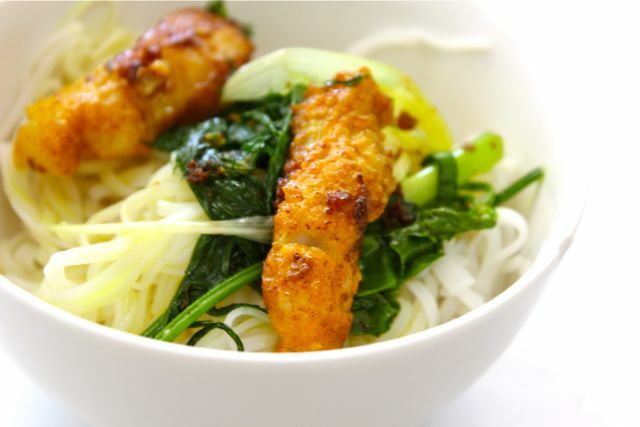 Looks oh so yummy… Did you put any seasoning to the blanched noodles? MM, what was their local version of the bagoong like? I hear you on the dill…I was also in search of some this weekend. The only ones I spotted where in the Gourmet stall at the Salcedo market and some guy snapped up all the bunches right before my (forlorn) eyes! I was so sad that I bought a plant of local dill. The flavor is not the same but at least now I have something in my balcony to stave off the cravings ;) Making this soon…weeeee!!! I’ve been craving for this! Can’t seem to get dill anywhere ( tried Rustans, Cash n Carry, and SM awhile ago). Can the dish still have the same flavor without the Dill? Can it be replaced with another herb? 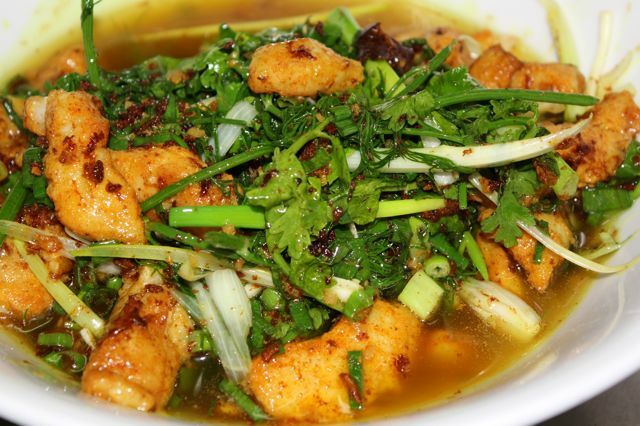 figured out the fish after a trip to hanoi last week, and a dinner at another cha ca place (not la vong). 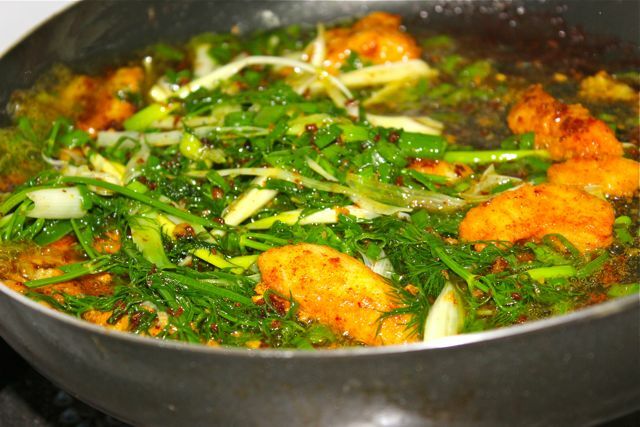 the fish is mudfish (dalag), which is abundant in hanoi, and sold in the markets either live or as fillets. thanks for the recipe, MM. my family is challenging me to do my cha ca version.